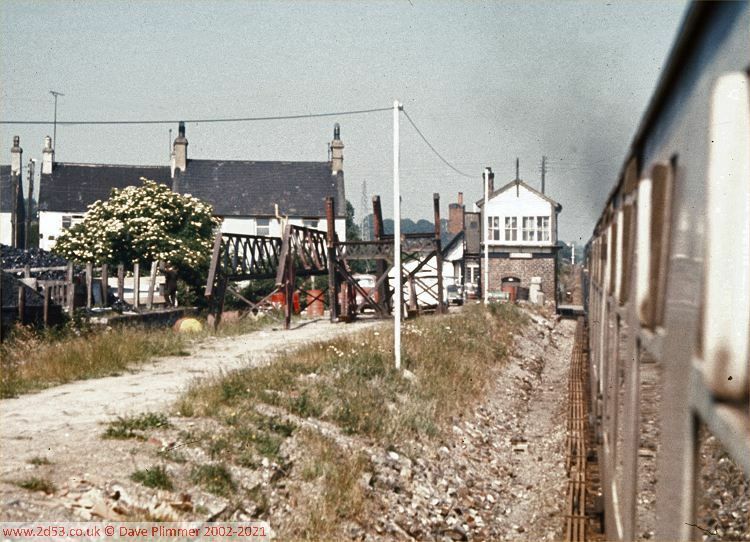 Gaerwen was an intermediate station between Bangor and Holyhead, and junction for the branch to Llangefni and Amlwch. The station was closed in the mid-sixties, but unlike Llanfair and Valley which closed on the same day, it has not been re-opened. 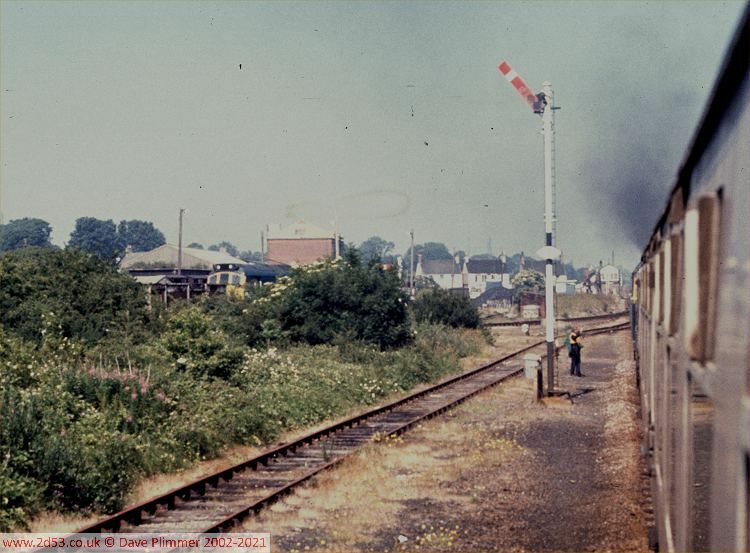 However, both the branch line and the freight yard remained open - the latter for coal and fertiliser traffic well into the 1980s. 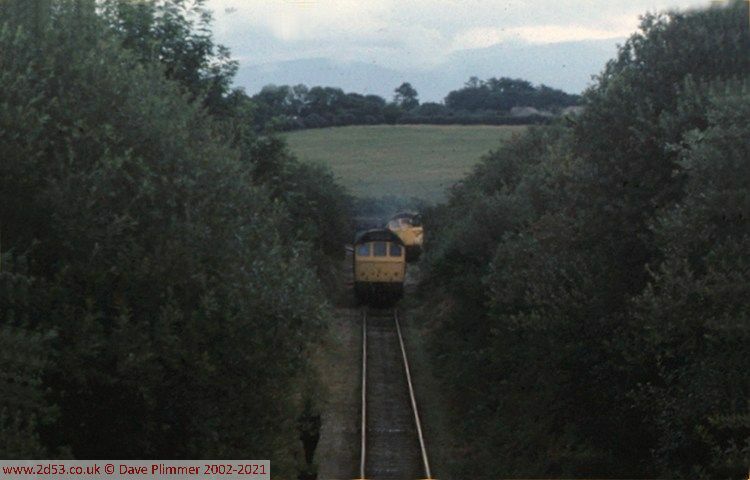 On 22nd July 1976, 24087 approaches Gaerwen from the Amlwch branch, propelling a train of empty ballast hoppers. 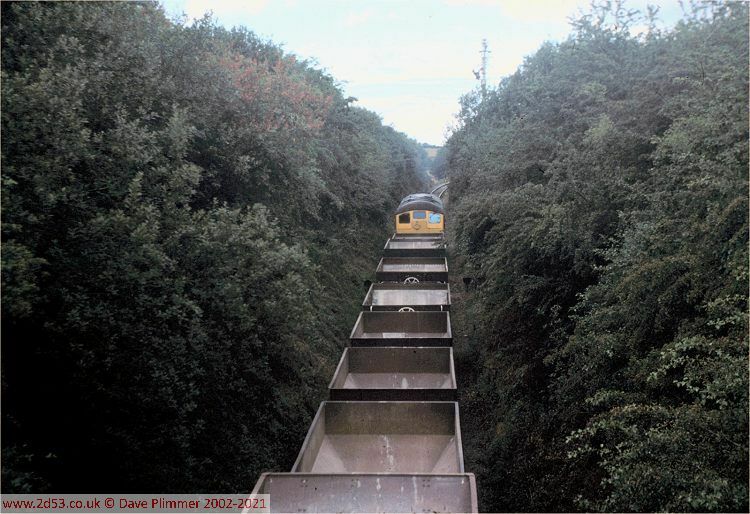 It had been engaged in PW work on the line beyond Llangefni. Visible above the loco is the top of the signal post that opnec carried the branch outer home and advanced starter signals for Gaerwen No 2 box. 25283 was in the yard at Gaerwen with one of the two daily trips to Amlwch, waiting for 24087 to clear the single line section. The two trains passed in the branch sidings, the only time I ever saw more than one train on the branch at the same time. 22nd July 1976. 25314 waits to come off the branch on the 11th July 1977, with the afternoon working from Amlwch, as the Class 47 hauled train from Holyhead passes. The first wagon of the freight is an empty coal wagon from the Gaerwen yard. In the distance Gaerwen signal box (originally Gaerwen No 1) is seen at the level crossing. On the same day, we see the signal box at the end of the disused station platform. Note also the remains of the station footbridge, recently removed. This was very close to the signalbox, and was the reason for the nameboard being placed low down on the box, rather than above the windows as was usual. 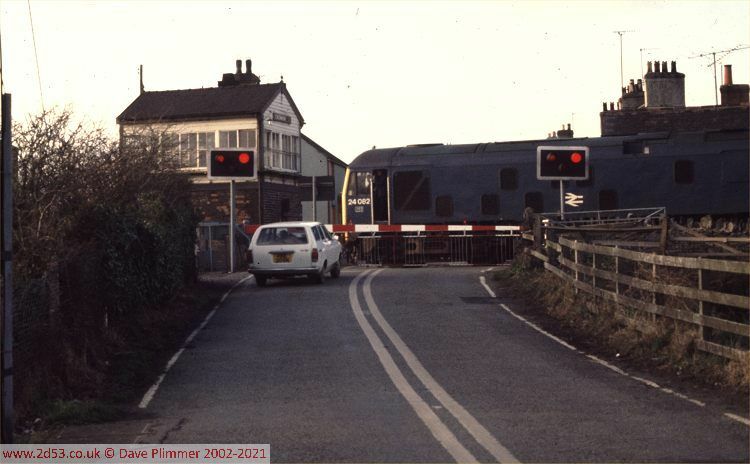 On the 3rd of January 1978, 24082 reverses across the level crossing with the afternoon trip to Amlwch. This normally ran from Llandudno Junction, but on this day had run through from Mold Junction, presumably becaue the previous day (Monday) had been the New Year's Day bank holiday and freight workings were running to modified timetables. Gaerwen signal box seen here was originally Gaerwen No 1, and the spaces on the box nameplate occupied by the numbering are still visible in this picture.